We have yet another tragedy of a gay student bullied to the point that he committed suicide. 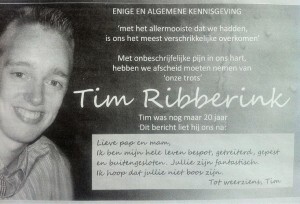 Tim Ribberink, 20, left a note saying that he simply could not take the teasing and isolation anymore despite his love for his parents. His image puts another face on the costs of homophobia and intolerance. Ribberlink was studying to be a history teacher. In the United States, such a message could not be a criminal matter. However, some countries have criminal laws against hateful or insulting speech directed against groups or individuals. I have been critical of such laws due to the threat to free speech. Yet, such attacks are potentially subject to civil liability in the U.S. — an issue that we discussed with regard to the Megan Meier suicide. The difference here is that Eric was older than Megan, but the sense of isolation appears the same. In the Netherlands, the criminal code prohibits insulting a group (article 137c) and inciting hatred, discrimination or violence (article 137d). He who publicly, orally, in writing or graphically, intentionally expresses himself insultingly regarding a group of people because of their race, their religion or their life philosophy, their heterosexual or homosexual orientation or their physical, psychological or mental disability, shall be punished by imprisonment of no more than a year or a monetary penalty of the third category. I do not believe that even such tragedies call for criminalization of such insulting speech. However, it should further motivate us all to combat homophobia and intolerance in society. This should include pursuing some of these homophobes for civil liability when they falsely assume identities or spread stories about victims. As for Eric, it is too late. Homosexuals have been given a higher status simply because of their sexual behavior. A “hate crime” makes punishment more severe since the victim has a certain sexual behavior. I once heard something about everyone being equal. If certain people are of a higher status because of their sexual behavior, how is this equal? Additionally, the word homophobe is an obsolete word. The reason being is that phobia implies fear, but of the general consensus regarding homosexuality, the emotion is not of fear, but of disgust. You say disgust but in your case I think its temptstion. I have to go with them having issues with their own sexual identity first and foremost. Homophobia has always been a bit of a mystery to me. It seems like a really silly thing to be prejudiced against someone for something that really doesn’t involve you – only the person and whomever they are intimate with – which to me has always been the epitome of nobody’s business but theirs as long as they are consenting adults. Naw, it is because that they doubt their maleness. And fear their wee-wees are too small. I once knew a guy, bisexual and comfortable with that. We called him Little John because of his short stature. But he was a musculous former Marine Captain with Vietnam behind him. He had a whang which kept the ladies standing in line at “parties”. A mixed pleasure for him. Just shows that some are comfortable with who they are. Smoking will do that. Did ma at 48 so guess that I was doing good at 30 a day. Heterosexual men and allegedly heterosexual men who verbally and/or otherwise attack homosexual men do so, IMO, because they haven’t got any balls. You look like the Jewish Marlboro man. I first smoked what cigs I could steal from old man..Chesterfields. I then went to Kool and ended up a Marlboro red box man. Good for keeping joints in tact. Never more than a pack a day. Being a baseball player I also tried chew. I hated it. I quit @ age 36. Tried to quit once, cold turkey, and did it. I’m a willful bast@rd, a double edged sword. Sticks n stones can break my bones but names can never hurt me. Unless you call me a fag. The bullies of the world need to be beat up. I bigger guy should always beat up a bully who is picking on smaller guys. Holland and the Dutch are so tolerant and also the worse bigots we have internationally. Visit or study a little. It is evident. And has been cruelly regiment-oriented. Let us say that some “vices” are tolerated well, but not others. Not so many years since the “Potato Eaters” was painted. And where did the Boers come from? Why was the opulence of the Biblical orient so attractive as motives for Rembrandt? Because black and white were the colors allowed by the puritanical church. To the most beautiful (person) we had, a most terrible (event) happened. I hope there is enough outrage in The Netherlands to cause some awareness and perhaps be some positive social change. Though I recognize this will be of no consulation to the family and for Tim in that he was driven to take his life. Next time I am over there I would like to see some form of recognition in the public for what Tim went through. Maybe that he was the last will allow him to have some form of a longer life in this world. bettykath, Middle school can be the cruelest, I taught 8th grade for a year. Kids are just understanding their sexuality and it is a time bomb of hormones, anxiety, anger, etc. MikeS, A tribute to the human spirit that can overcome so much. If one channels their pain as you have it turns a negative into a positive. Unfortunately not much has changed. What kind of cigs did you smoke..I’m betting Kools. I smoked Kool non filters once, a bigger wallop than Camels! packs a day. It’s little wonder how that first attack hit me at age 37. …, as well as bullying, mobbing, and the like. In addition to the tragic suicides, there are implications for school, workplace and community violence. We need to pay attention. I was a substitute teacher in a middle school class. One student talked about being the object of gay bashing. I tried to report this to the principal for action. His response, “Well, is he gay?” My response, “Why does it matter?” He walked away. Nothing was done. It was my last day as a sub in that school. Back in High School I used to be called Fag, Queer, Homo and Sissy a lot because I was shy, bookish, inept in sports and had a big vocabulary. I fought hundreds of times battling off the attacks of bullies and lost most of them, because there were usually accomplices in back of me hitting and pushing me as I fought my attacker. As I fought, I would cry tears of rage at the injustice of being forced into unfair fights. Because many of the bullies were star athletes I got little aid from Teachers, or the School Administration. Interestingly, the bullying ceased in the middle of my Junior year, because I was the only one of the “smart” kids that rebelled against the School Administration. It also helped that I was the only one of the smart kids who smoked in the “boys room” ,with the “hoods” who were also alienated. They were the “left back” kids and the real tough guys in school. They protected me, mainly to the extent that my fights were fair, one on one, and I stopped being an easy target. One of my takeaways from that experience was that I always hated the oppression of Gay people and spoke out against it before Stonewall. One either identifies with the oppressors, or opposes them. I like to think of myself being pretty shock proof, having experienced much in my 60 years. However, when I started teaching in the late 90’s I was appalled @ the bullying of gay students, particularly boys. I had a reputation as a “cool” history teacher mostly because I had real world experience. I expended all of my political capital influencing the bullies, some jocks but certainly not the majority, to cease. I also saw the key was to enlist righteous students to make the bullying unnacceptable and uncool. You can have all the regulations in the world, but the culture has to be patrolled from within. I learned that best working @ Leavenworth. The most @ risk kids are fat, gay, rural boys. Life is hell for those poor kids..HELL!